Impulse : All about Shamsath’s July Haul! Makeup Fashion & Everything I Like : Shourima's favourite 6 Teen Teen & Miss Claire lipstick swatches! Puja @ cutenails : Puja had a very good and fun time with her daughter while doing their nails with new OB stamping plates. 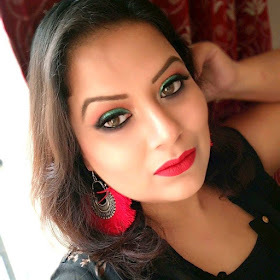 Ritu @ The Indian Beauty Blog : Ritu showcased her drool-worthy collection of lip-products, including a lot of lipsticks, lip glosses, lip-liners, lip-balms, and the famous MAC Lip Erase for pigmented lips. Our External World : Take a look at how easily Shilpa creates this bridal nail art using gold peacock water decals. Check out the detailed step by step tutorial. Makeup Is Art & Im An Artist!! Sh@z takes an extra step jumping from the wearable looks to fun colourful eye look inspired by Flowers !! Ray-TheBeautySpecialist! : Ray shares her five best aqua tipsfor beautiful you!